Botanical Art Worldwide, initiated by the American Society of Botanical Artists (ASBA), brings 25 countries from around the world together to celebrate global plant diversity by creating exhibitions of plants native to their home regions. Artists around the world have contributed to this project to build partnerships between artists, institutions, scientists, and the public, with the goal of raising awareness of both the beauty of botanical species and botanical art. The "Art of the Plant" is Canada's contribution to this groundbreaking exhibit. 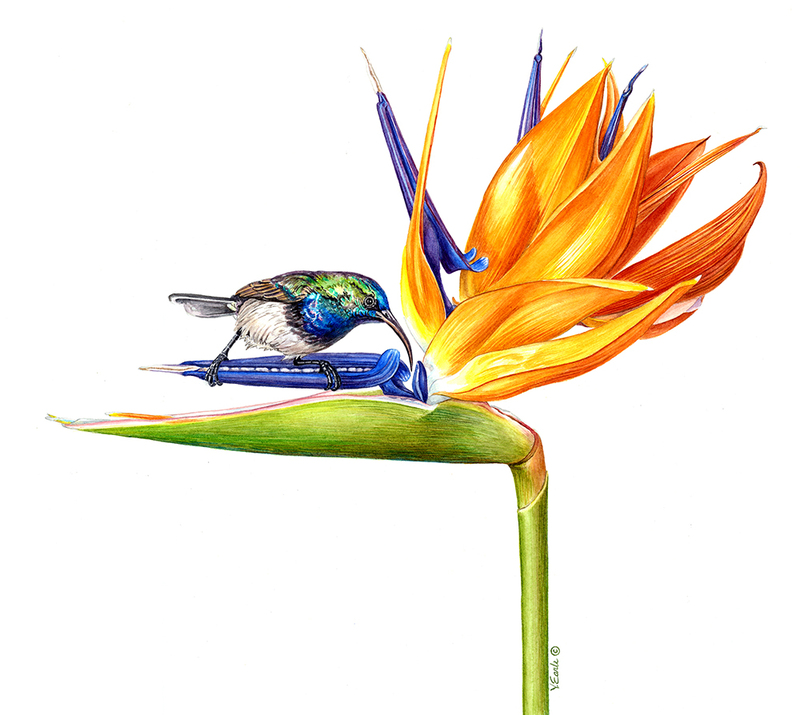 'White-bellied African Sunbird and Bird of Paradise Flower' is juried in to the 2018 Artists for Conservation Annual Exhibition, on display at the Vancouver Convention Centre, on display in conjunction with the 27th International Ornithological Congress, August 19-26. Vicky is accepted as a Signature member to the Artists for Conservation. 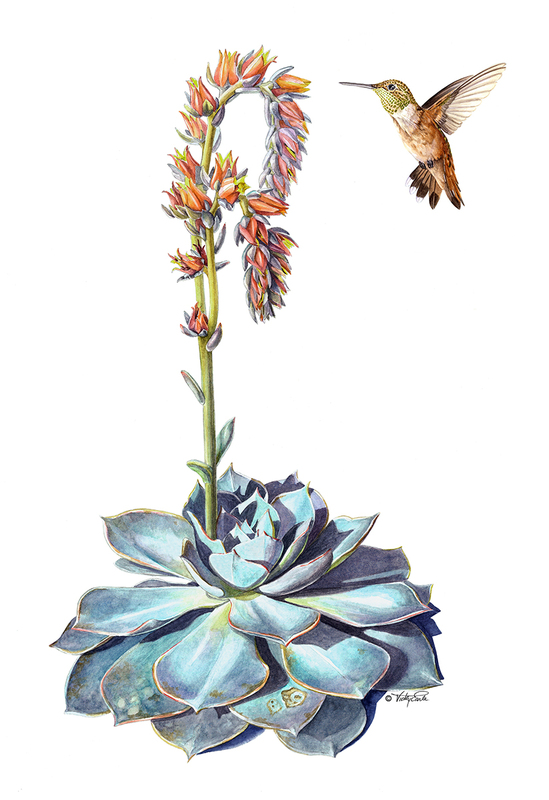 'Echeveria Succulent and Hummingbird' is juried in to the virtual exhibition of the Artists for Conservation exhibit in conjunction with the 27th International Ornithological Congress, 2018. 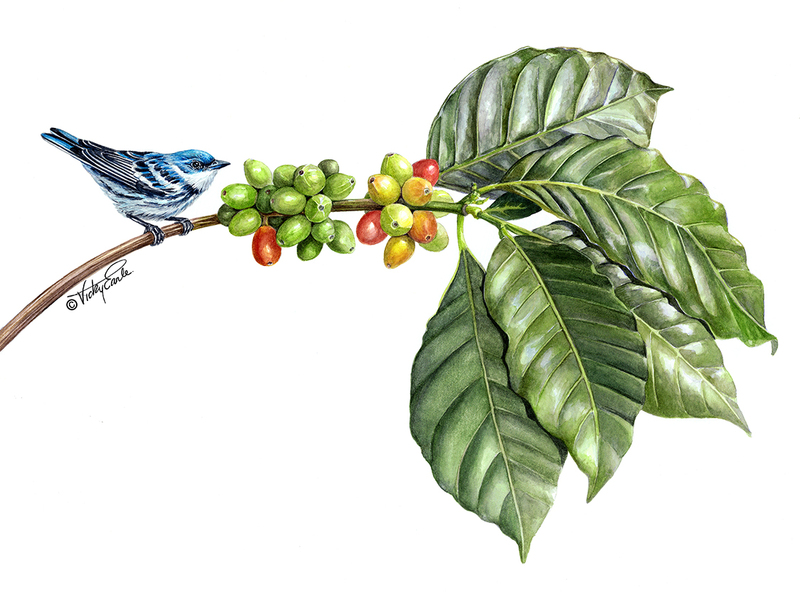 This painting highlights the importance of different habitats for the survival of migratory birds. This flower is specialized for hummingbird pollination, and is a critical food source during their migration. 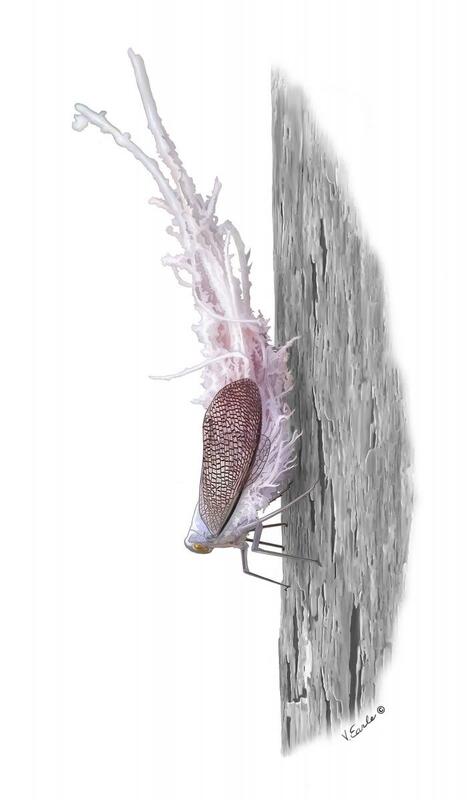 Duets: The Dance of Symbiotic Relationships is a solo exhibition of interpretative, educational panels that highlight unique plant adaptations and unusual relationships with insects, animals and humans. The project aims to bring attention to the interactive dance of two distinct species in nature that, together, creates harmonic relationships allowing life to move forward. This project’s goal is to promote educational awareness of the interdependence of species within tropical ecosystems, as well as our own dependence on plants. Vicky's Wax-tail Hopper is one of two paintings juried into the Focus On Nature XIV Exhibition at the Roger Tory Peterson Institute, New York, sponsored by the New York State Museum. This piece was created to share the incredible ingenuity of nature and the wonderful world of insects. The intricate tail is made of waxes secreted by the insect for protection, making each hopper unique in its presentation. Females also protect newly laid clutches of eggs with this wax. Wax-tail Hopper is now part of the New York State Museum's permanent collection. 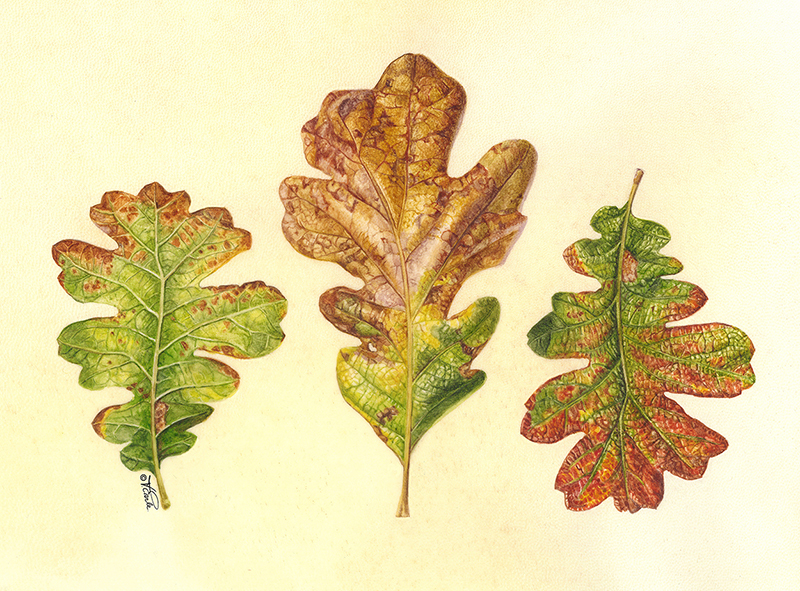 Vicky is awarded the Anne Ophelia Dowden Art and Education Grant sponsored by the American Society of Botanical Artists. 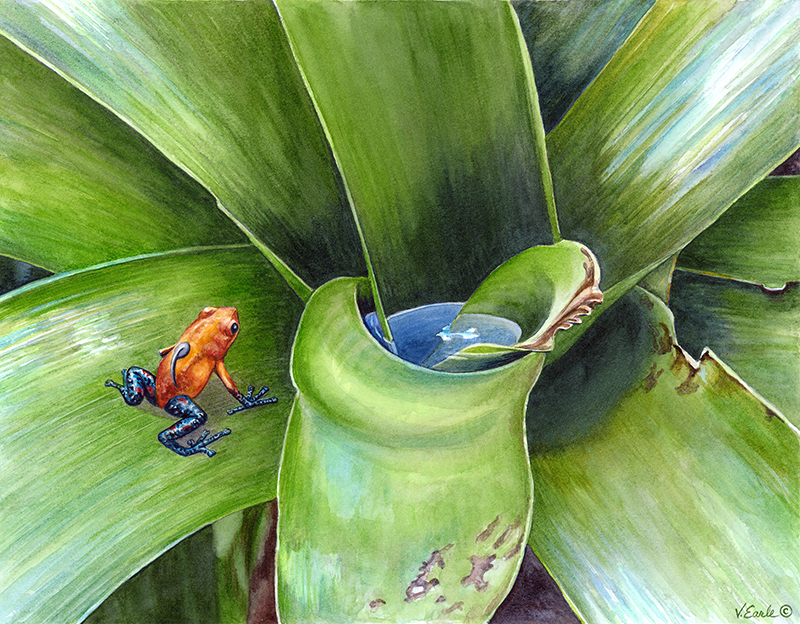 Recipient projects must show careful observation and scientifically accurate portrayal of plants; focus on specific techniques for portraying plants and botanical art; and provide educational materials developed in conjunction with public exhibition for the benefit and promotion of botanical art.